Classroom Freebies Too: Get Ready for Back-to-School! Hi! I am Mrs. D from The Third Wheel, and one of the newest contributors to Classroom Freebies Too! I am super excited to be joining the team, and even more excited to be sharing today's freebie with you. I've officially been told my that I cannot get back into my classroom until August 11th. Therefore, I've been doing lots of things from home to prepare for the new year so I can focus on setting up my room those first few days back. 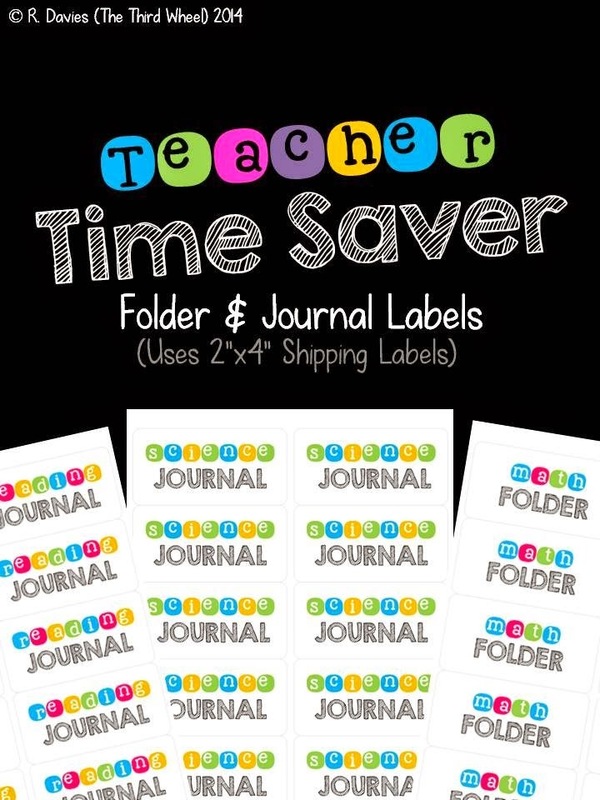 From shopping for folders and journals (Yahoo for Back-to-School sales!!) to starting to look at my organizational system, I've been a busy lady! Today I decided to go a little different direction. In the past I've had some super cute journal labels. However, they were not at all ink friendly. (Think BLACK backgrounds...YIKES!). This year I decided low-ink was the way to go, but I still wanted something that looked good on my students' folders and journals and had a cohesive look. (I am a little crazy about the coordination, but it would drive me crazy if they didn't go together. So here is what I came up with, and I hope you love them as much as I do!